© 2008 Wayne Wolf Overheads for Computers as Components 2 nd ed. Processes and operating systems zScheduling policies: yRMS; yEDF. zScheduling modeling. 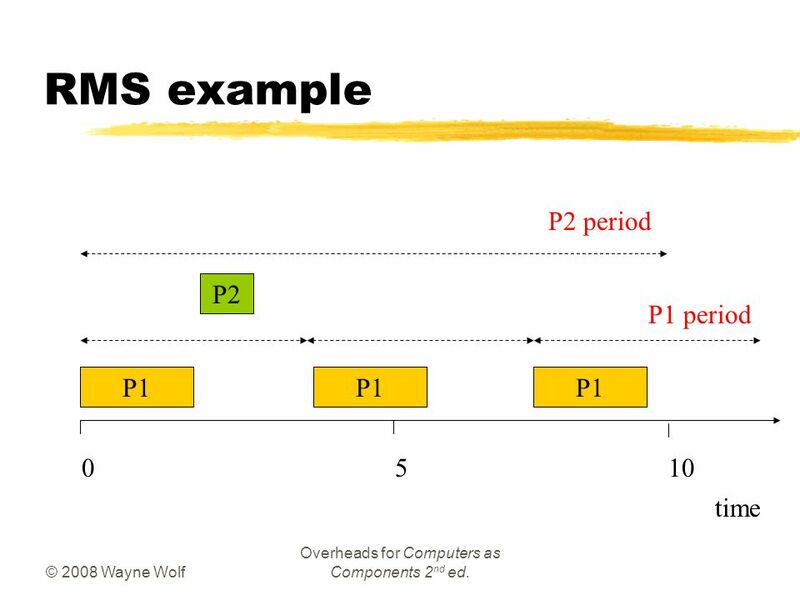 1 © 2008 Wayne Wolf Overheads for Computers as Components 2 nd ed. Processes and operating systems zScheduling policies: yRMS; yEDF. zScheduling modeling assumptions. 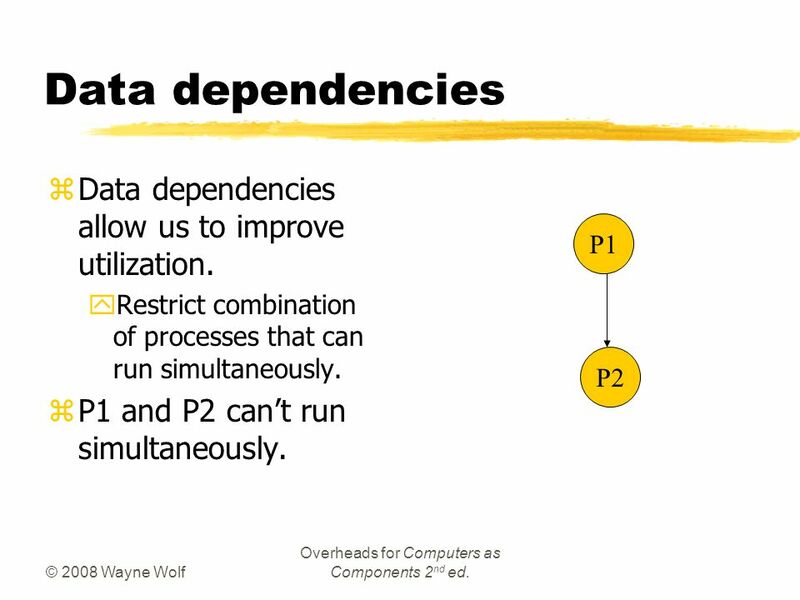 2 © 2008 Wayne Wolf Overheads for Computers as Components 2 nd ed. 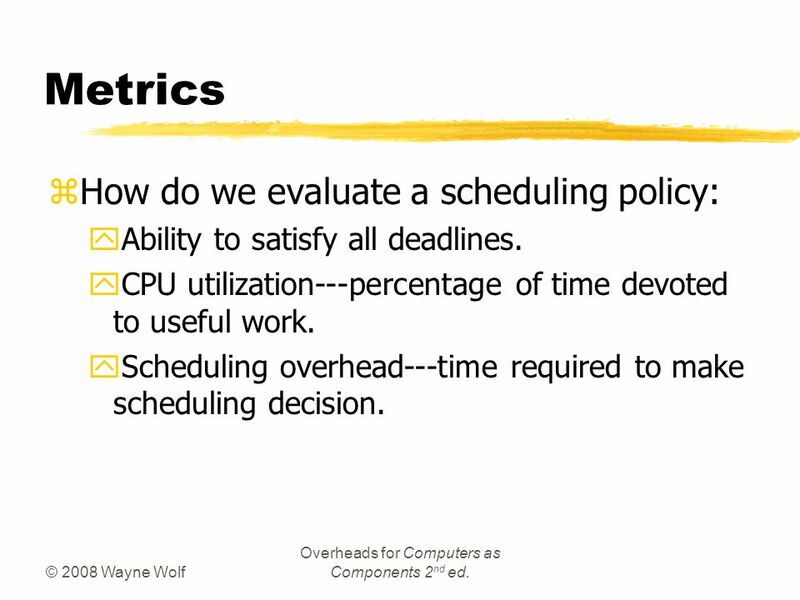 Metrics zHow do we evaluate a scheduling policy: yAbility to satisfy all deadlines. yCPU utilization---percentage of time devoted to useful work. yScheduling overhead---time required to make scheduling decision. 3 © 2008 Wayne Wolf Overheads for Computers as Components 2 nd ed. 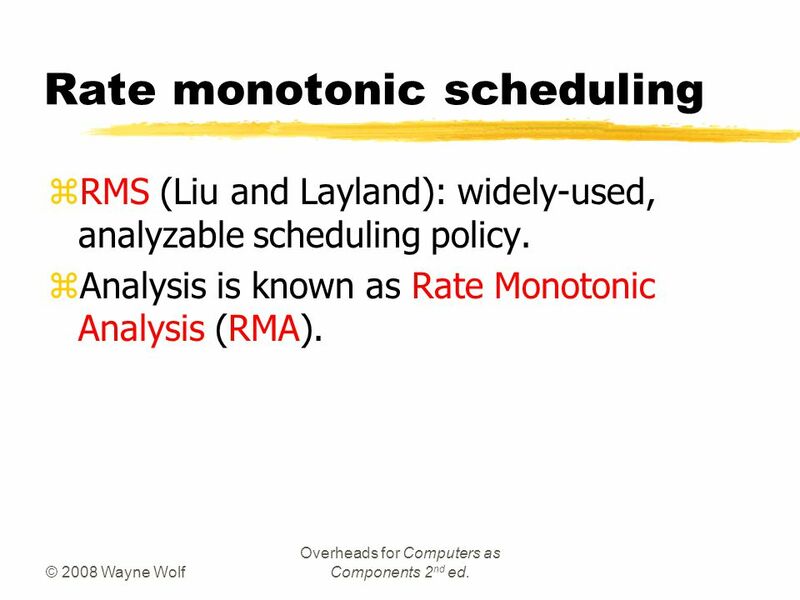 Rate monotonic scheduling zRMS (Liu and Layland): widely-used, analyzable scheduling policy. zAnalysis is known as Rate Monotonic Analysis (RMA). 4 © 2008 Wayne Wolf Overheads for Computers as Components 2 nd ed. 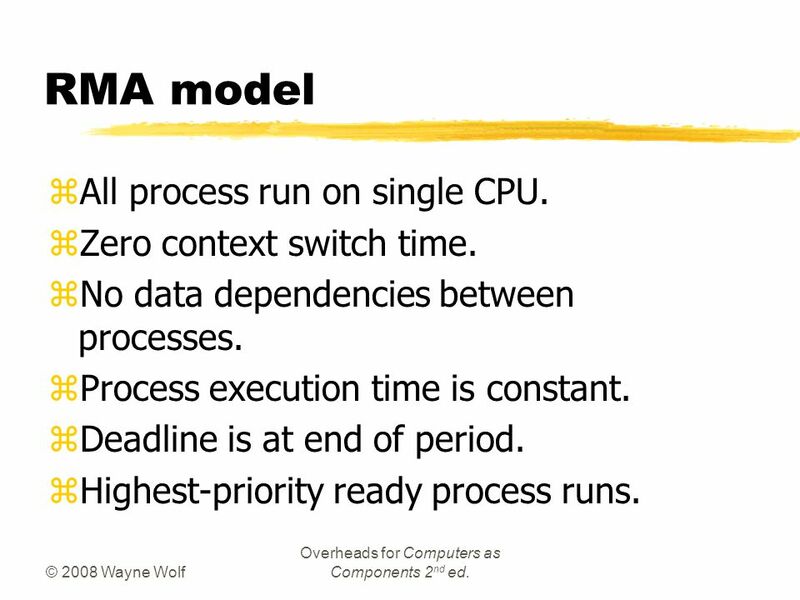 RMA model zAll process run on single CPU. zZero context switch time. zNo data dependencies between processes. zProcess execution time is constant. zDeadline is at end of period. zHighest-priority ready process runs. 6 © 2008 Wayne Wolf Overheads for Computers as Components 2 nd ed. 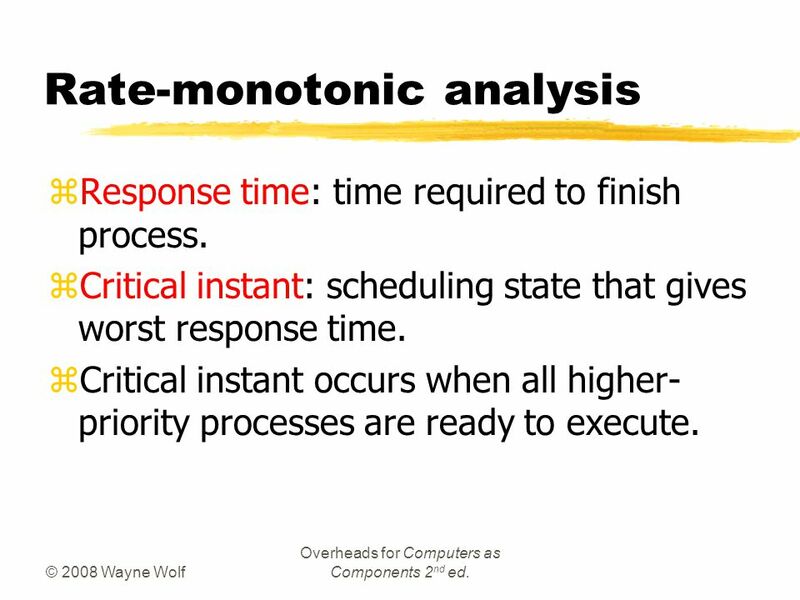 Rate-monotonic analysis zResponse time: time required to finish process. zCritical instant: scheduling state that gives worst response time. 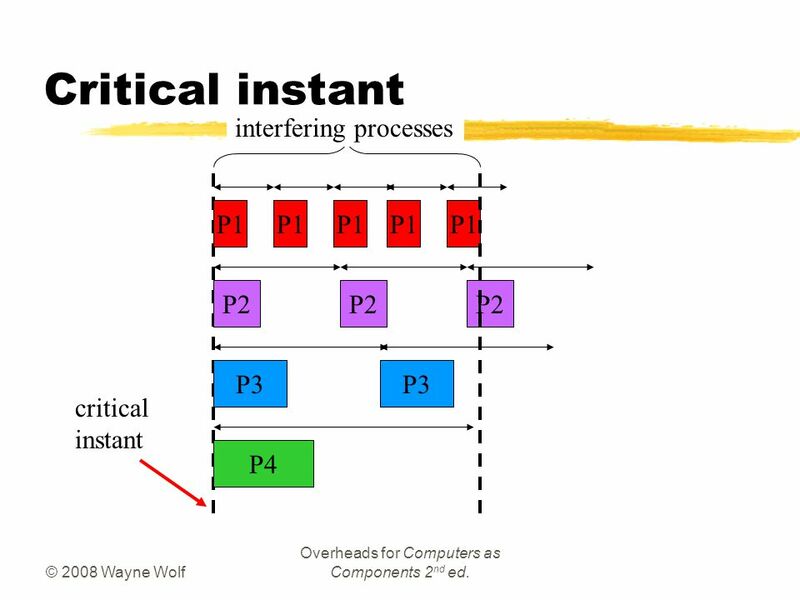 zCritical instant occurs when all higher- priority processes are ready to execute. 8 © 2008 Wayne Wolf Overheads for Computers as Components 2 nd ed. 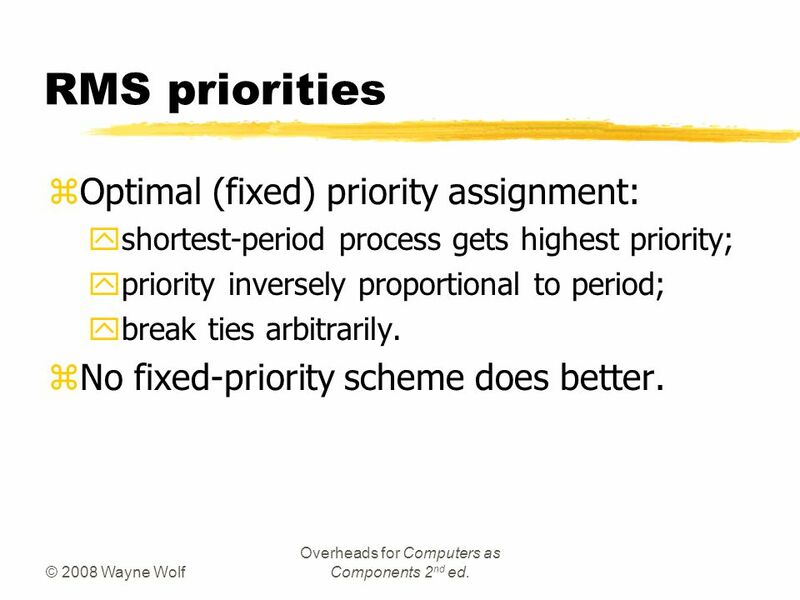 RMS priorities zOptimal (fixed) priority assignment: yshortest-period process gets highest priority; ypriority inversely proportional to period; ybreak ties arbitrarily. zNo fixed-priority scheme does better. 10 © 2008 Wayne Wolf Overheads for Computers as Components 2 nd ed. 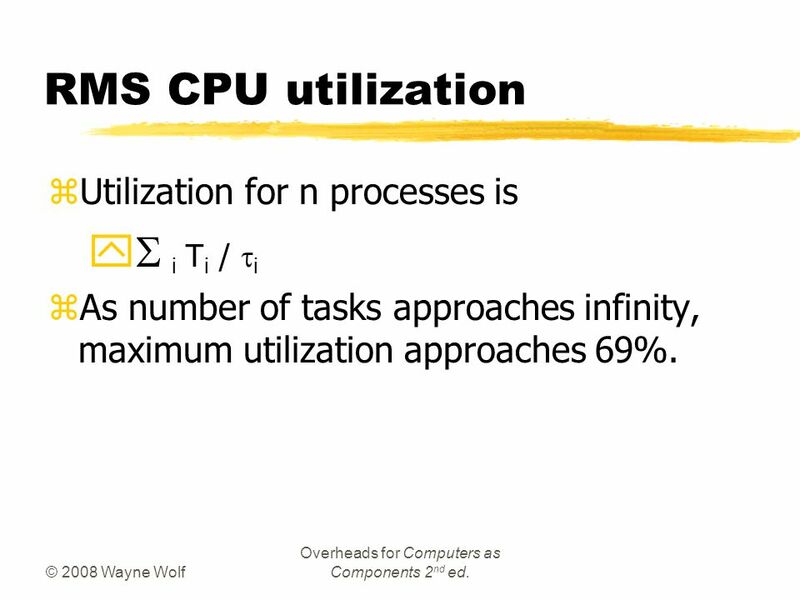 RMS CPU utilization zUtilization for n processes is   i T i /  i zAs number of tasks approaches infinity, maximum utilization approaches 69%. 11 © 2008 Wayne Wolf Overheads for Computers as Components 2 nd ed. RMS CPU utilization, cont’d. 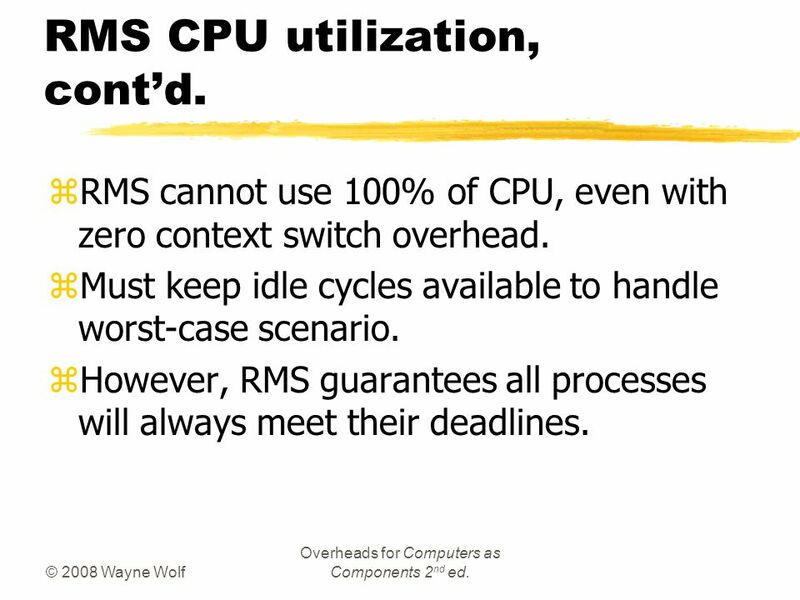 zRMS cannot use 100% of CPU, even with zero context switch overhead. zMust keep idle cycles available to handle worst-case scenario. zHowever, RMS guarantees all processes will always meet their deadlines. 12 © 2008 Wayne Wolf Overheads for Computers as Components 2 nd ed. 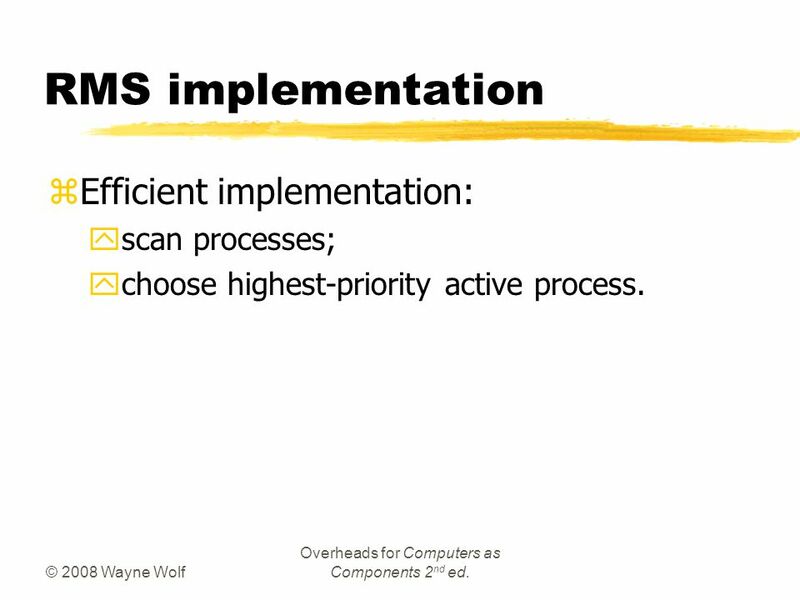 RMS implementation zEfficient implementation: yscan processes; ychoose highest-priority active process. 13 © 2008 Wayne Wolf Overheads for Computers as Components 2 nd ed. Earliest-deadline-first scheduling zEDF: dynamic priority scheduling scheme. 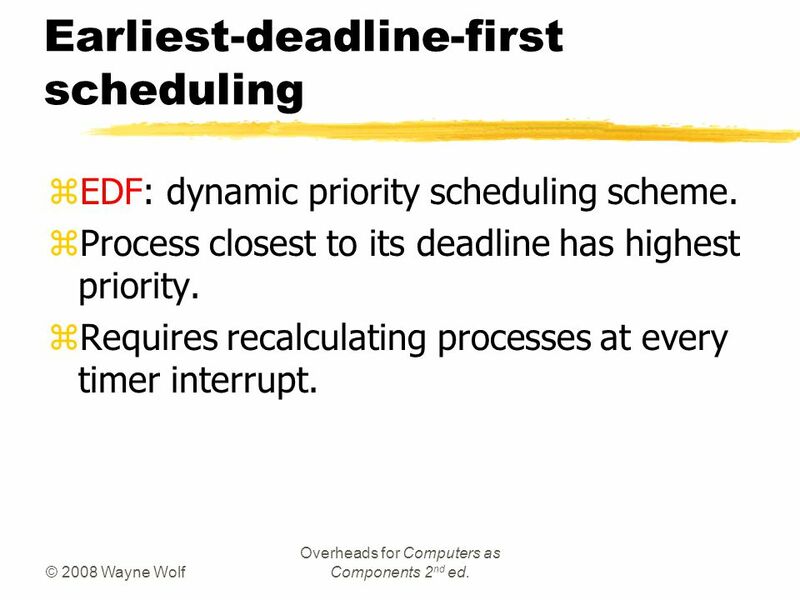 zProcess closest to its deadline has highest priority. zRequires recalculating processes at every timer interrupt. 14 © 2008 Wayne Wolf Overheads for Computers as Components 2 nd ed. 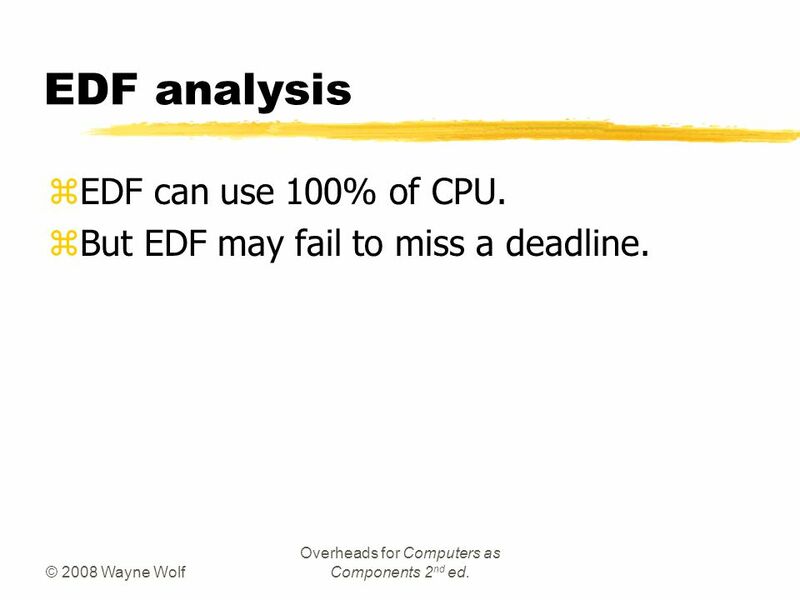 EDF analysis zEDF can use 100% of CPU. zBut EDF may fail to miss a deadline. 15 © 2008 Wayne Wolf Overheads for Computers as Components 2 nd ed. 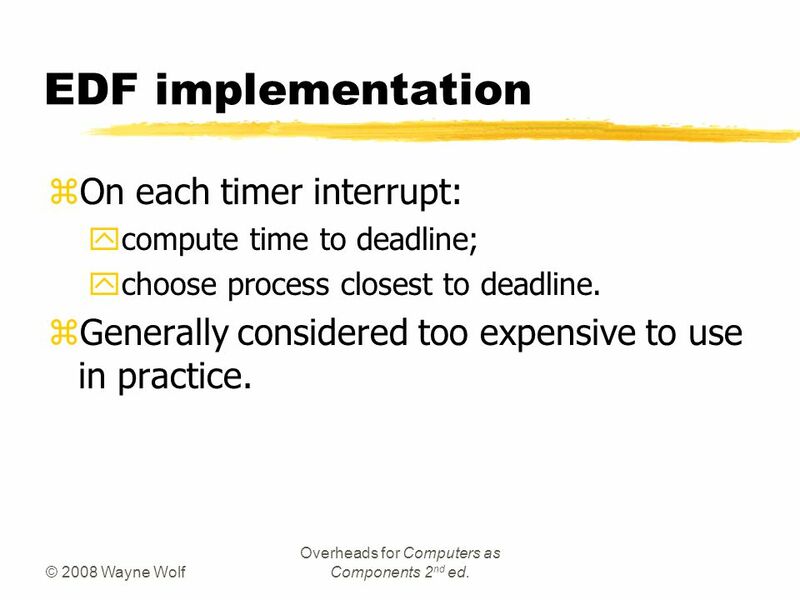 EDF implementation zOn each timer interrupt: ycompute time to deadline; ychoose process closest to deadline. zGenerally considered too expensive to use in practice. 16 © 2008 Wayne Wolf Overheads for Computers as Components 2 nd ed. 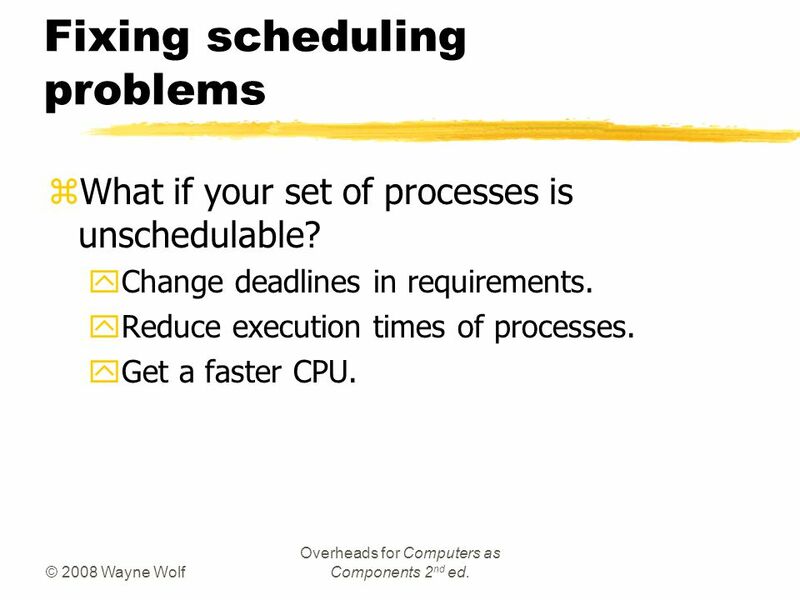 Fixing scheduling problems zWhat if your set of processes is unschedulable? yChange deadlines in requirements. yReduce execution times of processes. yGet a faster CPU. 17 © 2008 Wayne Wolf Overheads for Computers as Components 2 nd ed. 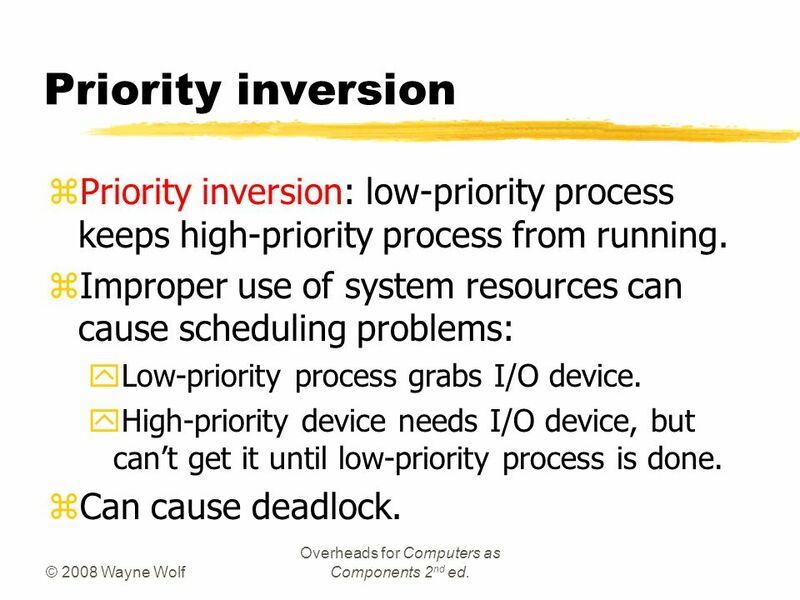 Priority inversion zPriority inversion: low-priority process keeps high-priority process from running. 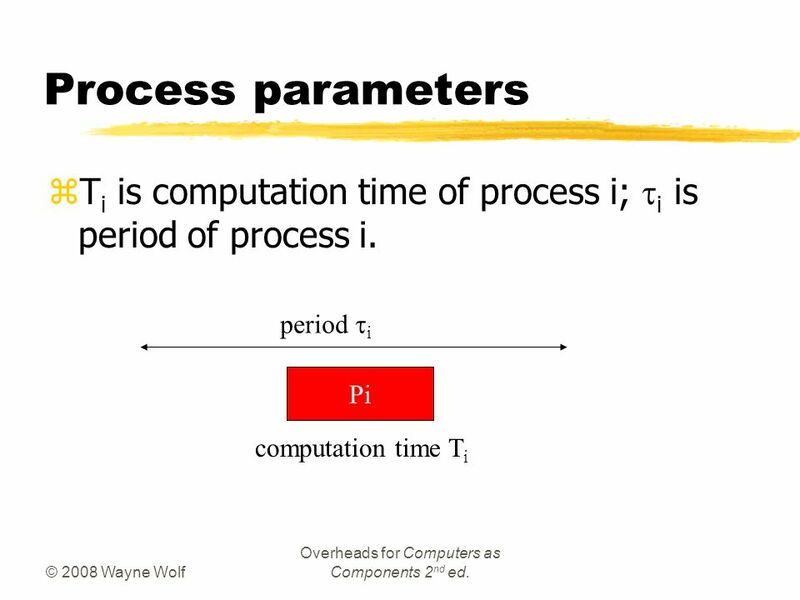 zImproper use of system resources can cause scheduling problems: yLow-priority process grabs I/O device. yHigh-priority device needs I/O device, but can’t get it until low-priority process is done. zCan cause deadlock. 18 © 2008 Wayne Wolf Overheads for Computers as Components 2 nd ed. Solving priority inversion zGive priorities to system resources. zHave process inherit the priority of a resource that it requests. 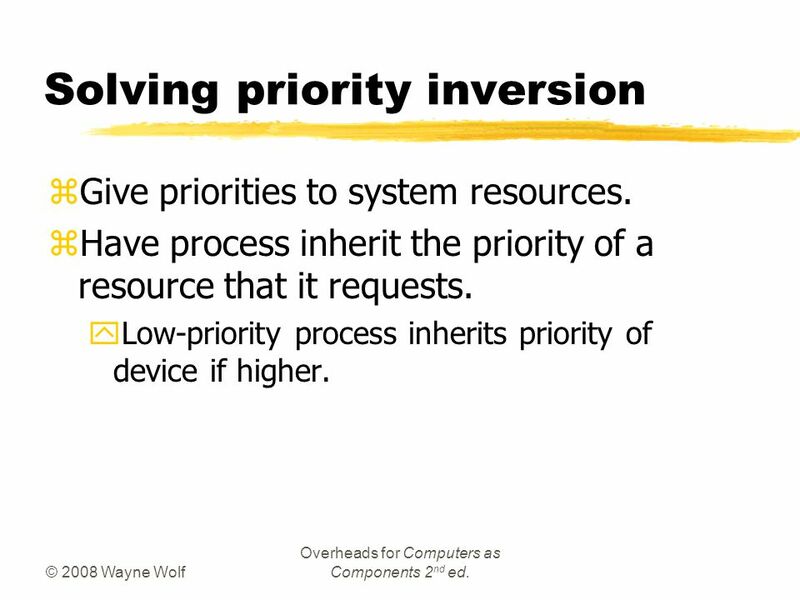 yLow-priority process inherits priority of device if higher. 20 © 2008 Wayne Wolf Overheads for Computers as Components 2 nd ed. 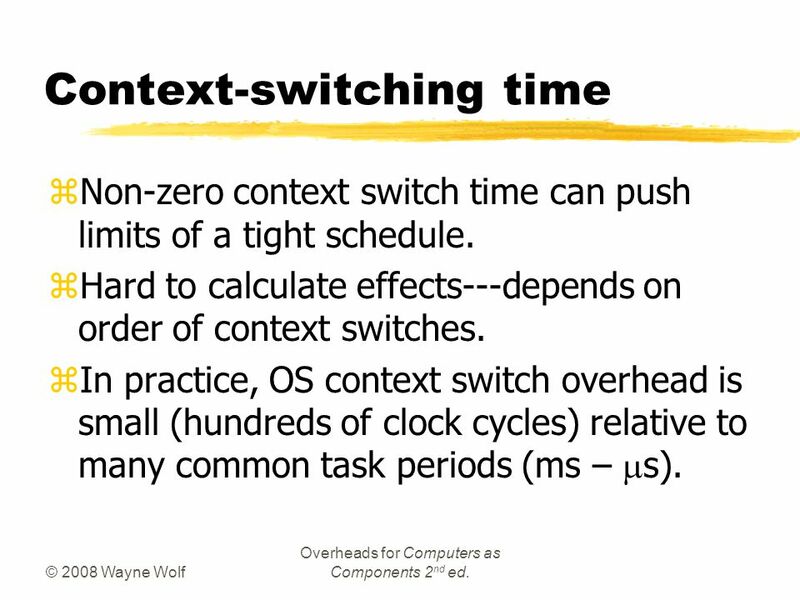 Context-switching time zNon-zero context switch time can push limits of a tight schedule. zHard to calculate effects---depends on order of context switches.  In practice, OS context switch overhead is small (hundreds of clock cycles) relative to many common task periods (ms –  s). Download ppt "© 2008 Wayne Wolf Overheads for Computers as Components 2 nd ed. Processes and operating systems zScheduling policies: yRMS; yEDF. zScheduling modeling." Simulation of Feedback Scheduling Dan Henriksson, Anton Cervin and Karl-Erik Årzén Department of Automatic Control. Washington WASHINGTON UNIVERSITY IN ST LOUIS Real-Time: Periodic Tasks Fred Kuhns Applied Research Laboratory Computer Science Washington University. 1 EE5900 Advanced Embedded System For Smart Infrastructure RMS and EDF Scheduling. Real-time concepts Lin Zhong ELEC424, Fall Real time Correctness – Logical correctness – Timing Hard vs. Soft – Hard: lateness is intolerable Pass/Fail. Tasks Periodic The period is the amount of time between each iteration of a regularly repeated task Time driven The task is automatically activated by. Operating Systems1 5. 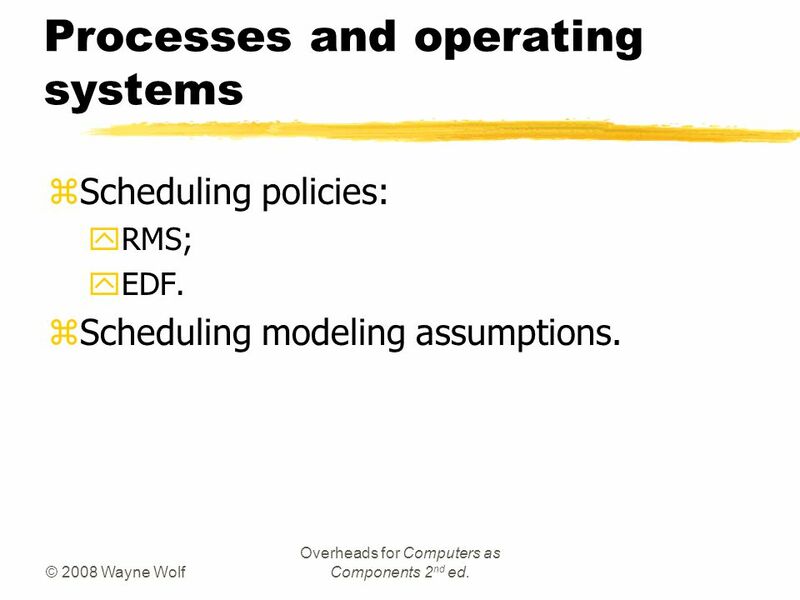 Process and thread scheduling 5.1 Organization of Schedulers – Embedded and Autonomous Schedulers 5.2 Scheduling Methods – A Framework. CPU SCHEDULING RONG ZHENG. OVERVIEW Why scheduling? Non-preemptive vs Preemptive policies FCFS, SJF, Round robin, multilevel queues with feedback, guaranteed. © 2008 Wayne Wolf Overheads for Computers as Components 2 nd ed. Processes and operating systems zMultiple tasks and multiple processes. ySpecifications. Courseware Scheduling Uniprocessor Real-Time Systems Jan Madsen Informatics and Mathematical Modelling Technical University of Denmark Richard Petersens. CS 3013 & CS 502 Summer 2006 Scheduling1 The art and science of allocating the CPU and other resources to processes.